If you can afford to buy a Koenigsegg, prepare to wait several years until you can drive it. For many, the dream of tearing up the track in a 1,160-horsepower Koenigsegg Agera RS will remain a dream unless you happen to win the lottery to afford the $2 million asking price. And even if you can cough up the cash, you’ll still have to wait several years until you can actually drive it. That’s because the waiting list for a Koenigsegg hypercar is currently four to five years, according to what company founder Christian von Koenigsegg said in an interview with Road and Track at Geneva. Currently, the manufacturer is cranking out between 16 and 20 hypercars each year including the Agera RS which is still being built. 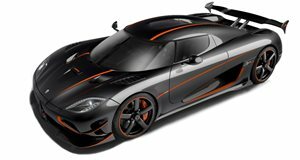 However, this year Koenigsegg wants to increase that rate up to 25, and at least 30 by the end of next year. Koenigsegg is also supplying Spyker with around 100 bespoke 6.0-liter naturally aspirated V8s which probably isn’t helping wait times, while the development of its cam-free engine technology must be taking up a lot of resources as well. We don’t think we’ll be seeing an attempt to set a record Nurburgring lap time in the Koenigsegg One:1 any time soon, somehow.